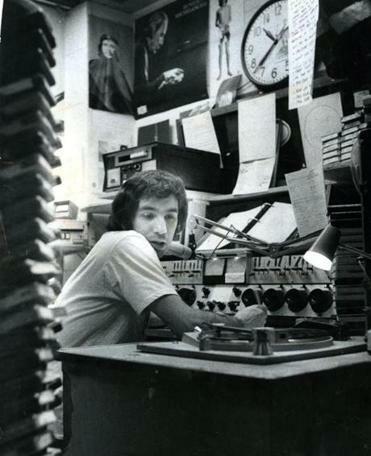 “They called me ‘One-Take Chuckie,’ ’cause I could never get it right on the first take,” says Charles Laquidara of his radio days at WBCN (above, at the studio in 1972). Don’t trust anyone over 30, as the hippies liked to say. When Charles Laquidara took a radio gig with the newly revamped, anything-goes WBCN in 1969, he was 30 years old. Now pushing 80, Laquidara — the stream-of-consciousness Milford native who became one of the most influential disc jockeys in the history of radio — has been “retired” for nearly 20 years, living large in his adopted home on the island of Maui. He returns to Boston for a sneak peek at “Daze in the Life,” his new “multimedia memoir,” at the Paradise on Wednesday. Laquidara spent a quarter-century at WBCN, the “Rock of Boston,” and followed that with five more years at WZLX. His long-running morning show, “The Big Mattress,” has often been credited as a forerunner in the now-pervasive concept of gabby, gimmicky drive-time radio. He’s led an eventful life. As an aspiring actor, he nearly got the part as the Boston Strangler in a 1968 movie that would star Tony Curtis as Albert DeSalvo. In Hawaii, he’s sold multimillion-dollar homes to Oprah Winfrey and Ram Dass. The online portal of “Daze in the Life” will feature rabbit holes for users to tumble into, including unearthed audio of old wake-up calls, his “Mishegas” quiz show bits, and other recurring features of Laquidara’s morning show, as well as video clips and loads of scrapbook photos. On a recent phone call from Hawaii, he’s still not sure how he’s going to get a full house of old friends at the Paradise to stay attentive enough to watch his slide show. Voice actor Billy West, one of the many finds Laquidara made as the ringleader of a daily on-air circus, is writing a live “Mishegas” segment, Laquidara says. The whole thing might be an unholy mess, but for Laquidara, that wouldn’t be anything new. At home in Hawaii, he’s just wrapping up a driving lesson in his Tesla for an old buddy, a helicopter pilot, who’s visiting. “This car will park itself,” Laquidara explains. For several years now, he has curated Charles Laquidara Radio, an Internet radio station playing a head-spinning mix of classic rock, ’80s nuggets, and the occasional Bessie Smith or Ella Fitzgerald record. Laquidara’s voice pops up intermittently, to wax nostalgic or rant about his latest peeve. On the phone, his conversation rambles from the ubiquity of bidets in France to that time he found a bunch of perfectly preserved old vinyl records in the closet of an old girlfriend’s recently deceased grandmother, from which he pulled out a 1950s novelty platter — the Singing Dogs yapping “Jingle Bells” — which he anointed the Big Mattress Song of the Week, launching, he claims, a nationwide revival for the song. Julie Brummer went to work for Laquidara in the 1990s, after she called in to take him to task for something he said on the air. That was how a lot of his production assistants arrived, she says with a laugh. Brummer and her husband, Simon, both computer programmers, are part of the core team creating the “Daze in the Life” site, which officially launches April 1. Laquidara is “a perfectionist,” she says — a perfectionist who has no problem making mistakes. “That’s both the head and the tail of Charles,” she says. “We lost a lot of [advertising] accounts that day from British car sales in Boston,” he recalls. Laquidara insists there was no big secret to his success. “I just went on air and I was myself. Underground radio was being yourself — no ego, playing a lot of music, reaching out to fellow stoners. “I was a cartoonist, but not great,” he says. “I was an actor, but I was no Brando.” Radio turned out to be the one thing he was made for. The new multimedia project is his version of an autobiography. The real key to being Charles Laquidara couldn’t be more fundamental. “I just get bored easily,” he says. Daze in the Life: Memories, Music & Mishegas!